I had a meeting in Martock on Friday. It reminded me of something that happened there, one of those remarkable Felix Felicis days when the world is a perfect place. In the morning I crouched in an attic watching a discovery and in the afternoon I stood on a high cliff edge in bright, clear sunshine hearing from Dennis, the professor, about how the landscape surrounding us came to be. I will tell you of the discovery in the attic. The Treasurer’s House is one of the South Somerset ‘small properties’ (like Stoke see April 14th). It has few visitors but it is an extraordinary place. One of the oldest occupied houses in Somerset after the Bishop’s Palace in Wells and in fact the two places are connected. 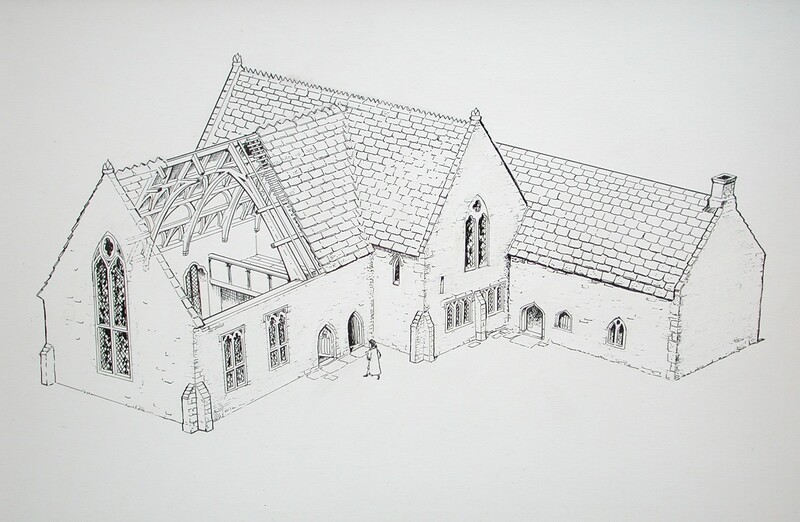 In the medieval period, The Treasurer’s House belonged to Wells Cathedral. The house and its land (this was a small manor), provided an income for the Treasurer of Wells, and in the 13th century, he lived here. Friday’s meeting was about involving the community at the Treasurer’s House, particularly young people. Roger called the meeting and invited us into his home and we walked round with Natasha, Lou, Verity and Louise who work with the local schools and youth club and will make it happen. I was there to provide information, support and advice. The great hall is stunning. In it, is a finds cabinet with a display of the things we found during the refurbishment of the house, including pottery, a personal bronze seal, and medieval painted glass. 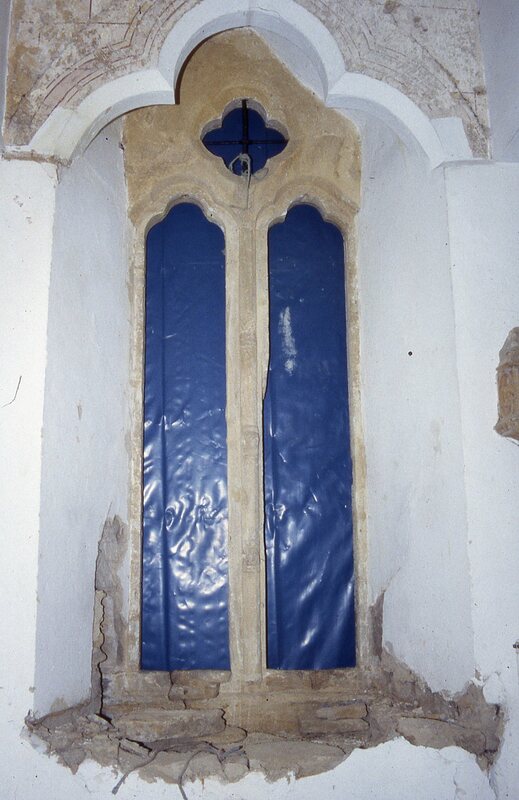 The 13th- century solar window as we first saw it with a few red lines exposed. After the medieval kitchen and parlour, we ascended the stairs to the Treasurer’s private room or solar. The oldest room in the house. I first saw this room with Tim the building surveyor over 20 years ago. The place was empty, damp and dilapidated and the last tenant had uncovered some red lines around the 13th century window. Tim let me have some money to call in Ann the plaster specialist. She was inspired. The red lines were contemporary with the window, so about 1250s. 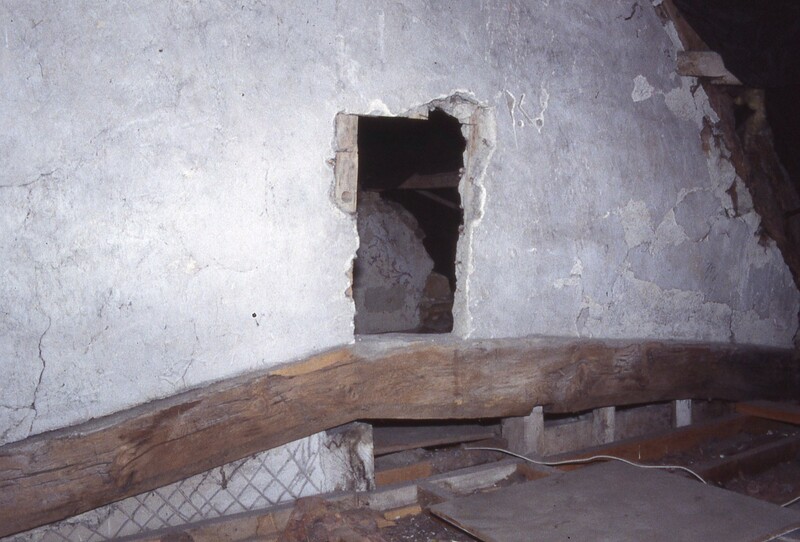 I said that there was more upstairs so we climbed up the step ladder into the loft and tip-toed across the joists, crawled through a hole someone had cut into wattle and daub until we were above the window. Medieval upper rooms were usually open to the rafters and the ceiling had been put in much later. Up in the attic. A glimpse of the vine-leaf decoration through the hole someone had cut through the wattle and daub panel. Hidden in this space for hundreds of years was a finely decorated wall. Part of a vine-leaf decoration had become visible at the edge. Ann switched her lamp on and brought out her tools. She said: ‘if there is a scene, it will be above the window here. Can I just see?’ She began to carefully remove the lime wash and found a red diamond shape and the fold of a cloak. Then she uncovered part of a halo. ‘I think I know what this is’ she said. ‘Can I just check?’ and soon, there was a halo and the head of a young man. Moment of discovery. 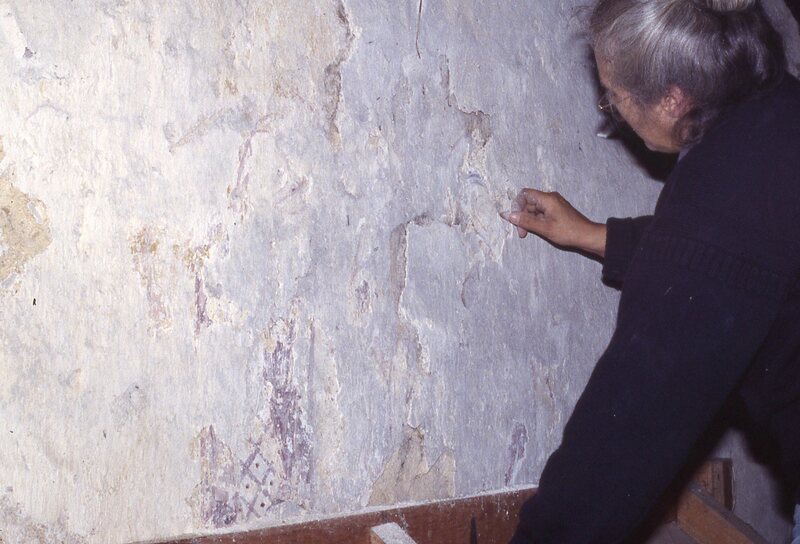 Ann cleans the 16th century limewash covering the 13th century figure. 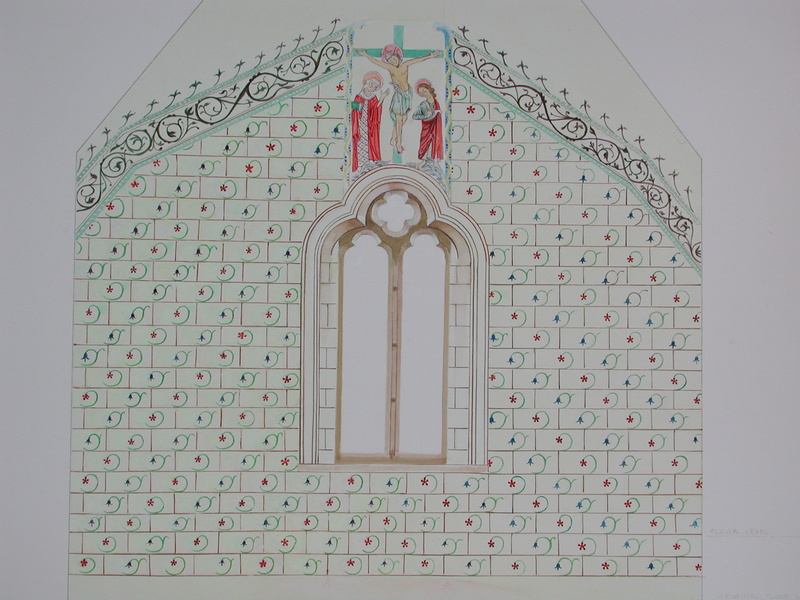 The scene was probably hidden as part of the Reformation when decoration within churches was painted over. How had it survived up there, unknown, for so long? Part of it had been lost through water seeping through a leak in the roof. At some stage someone had tested the attic plaster with a hammer. It was time to conserve it and make it visible so that it could be properly cared for. English Heritage agreed. The 19th century ceiling was removed and Ann revealed the scene infilling gaps with neutral white lime plaster. I wanted to see the face of Jesus.. but repairs to the top of the gable wall, a couple of hundred years ago, had removed the top of the scene. His body and his outstretched arms nailed to the cross were clear, as were the two figures below him. On the right, the young man held his book in which he wrote his eyewitness account (the medieval painter had made sure that the book was wrapped in part of his cloak because it was holy scripture) on the left was an older woman. The wall painting after conservation. Notice that very little survives below where the ceiling was because the room was replastered and decorated on many occasions but in the attic it remained unchanged. 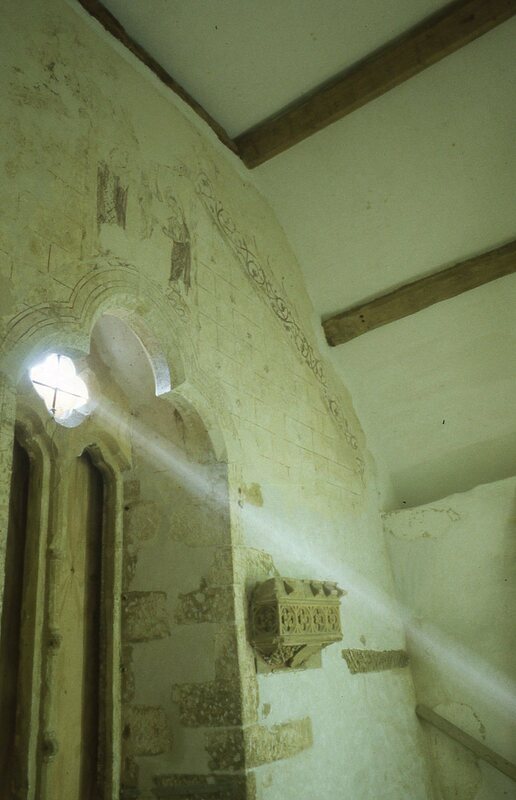 A 15th century light bracket to the right of the window. It is the central Christian theme of love which the Treasurer chose to place in his private room of prayer. Jesus crucified, asking his young disciple John to care for his mother, and for Mary to look after John. John wrote it in his book ch.19 v 26-27. Amazing. You must go there and see it. An artist’s impression of how the room would have looked when newly painted. Imitation red-line stone work with flower decoration harebells and pansies alternating. We excavated painted glass from the courtyard beneath the window so the window would have been highly decorated as well. The Treasurer was in charge of the decoration of the cathedral and therefore he would have known who to contact to decorate his house.